The road trip continues. Leaving the desolate stretch of Route 66 in Kansas behind, I paid a visit to the World’s Largest Totem pole before spent a night in a classic Route 66 motel in Oklahoma. From there my journey west continued as I watched the scenery morph from mountains lined with fall foliage to the flat desert of northern Texas. Along the way I talked to countless shop owners, heard tales of years gone by, gasped in awe of the red rocks in Texas, spray painted NYC onto a Cadillac sticking out of the desert and stood atop a giant blue whale. Located in the creator’s back yard, I made it in time for the tail end of dusk and barely had enough time to set up my tripod to take a photo in front of it. Another classic Route 66 motel that I spent the night in. This one was remodeled recently and was nicer than any of the chains I have stayed in so far. And…no bedbugs! A giant, life-sized wooden blue whale sitting over a lake with a dry water slide. Though the slide was closed years ago, the place is under new ownership and this team of seven local men is committed to keeping it as a tourist destination and Route 66 staple. This entire town was sight in itself. The main street looks just as it did 50 years ago and as it was Sunday and a big town-wide event had just finished, I pretty much had the place to myself. Alongside the new four-lane Route 66, segments of the original road still exist and are drivable for a mile or two at a time. This is strictly for nostalgia purposes and man did I eat it up! Advertised as the best Route 66 museum on The Mother Road, my guide book did not lie. 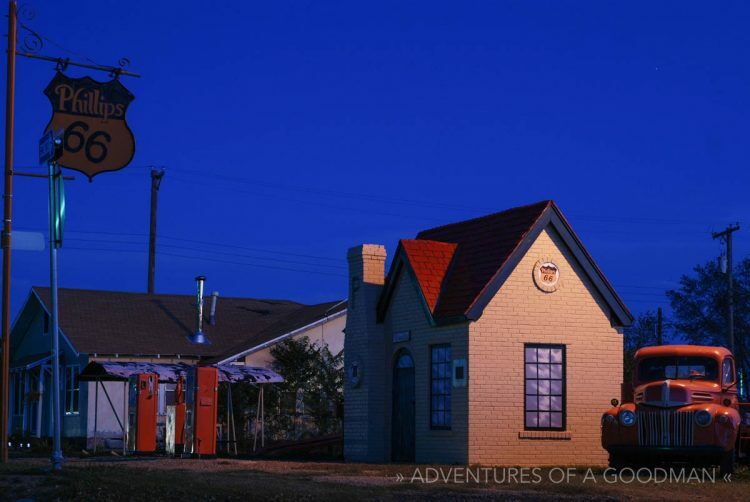 It was filled with old signs, recreated diners and gas stations, classic souvenirs, videos and a detailed history of Route 66. Another town that gets its own entry. It seemed that every two storefronts still had a sign of some sort outside or was a sample of beautiful architecture. Someone stuck 10 classic Cadillacs face-down into the desert outside Amarillo. In the years since, spray paint bottles are left there for visitors to add their own bit of art to the roadside attraction. I painted a “NYC” on one. My first meeting with the awe inspiring red rock deserts of the South, I spent the morning driving through the park taking it all in. A giant cowboy that used to be the icon of a roadside steak house now is all that remains of the business. Depending on which way you are driving, this dilapidated old shell of a motel and gas station sits on an abandoned stretch of Route 66. This sight was a real glimpse into what happened to towns when the interstate passed The Mother Road by.